20/20PI offers an industry leading 110% satisfaction guarantee! We are committed to getting rid of your pests on our first visit. If a follow up visit is necessary, there’s no additional fee. If within 60 days after an inspection or treatment you aren’t completely satisfied, we will refund 110% of your last payment. If your last payment was $90, we will refund the $90 plus 10% for a total refund of $99. Single family dwelling units only. Offer only valid with the purchase of a new basic periodic exterior residential Pest Control Plan, based on an annual agreement. Services are rendered and billed per the terms of your service agreement. This offer cannot be combined with any other offers or discounts. Additional limitations and terms may apply. Only one discount is available per household. 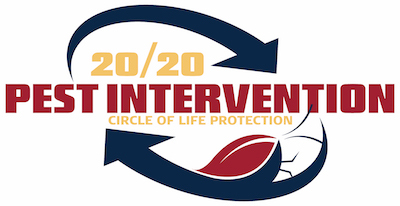 20/20 Pest Intervention (20/20PI) is proud to be recognized as a regionally owned business that provides personalized service. We offer a wide range of customized solutions that include Pest Control, Termite Treatment, Home Inspection, Rodent Control, Mold Assessment, and varied Environmental Testing. Schedule us to get a no cost, no obligation, in-home estimate today. Contact us at 407.878.2773 to schedule an appointment today or request one online. 20/20 Pest Intervention is proud to be recognized as a regionally owned business that provides personalized service. We offer a wide range of customized solutions that include Pest Control, Termite Treatment, and Rodent Control. Monday through Friday 7am to 6pm and Saturday from 10am to 2pm. Closed Sundays.